Hemi­spheric Conver­sa­tions Urban Art Project (hcuap.com) is taking over the garages at AIR for a one night only POP UP exhibit. 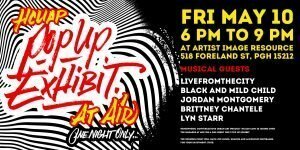 Featuring an inter­na­tional range of emerging and estab­lished artists pre-curated along­side an open call. The opening event will have live music, snacks and alco­holic bever­ages for your enjoy­ment. BYOB. HCUAP and Rivers of Steel are proud to present our latest collab­o­ra­tive mural at the historic Carrie Blast Furnaces with artists from Chicago, Léon Mexico, and Pitts­burgh. 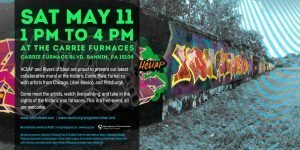 Come meet the artists, watch live painting, and take in the sights of the historic iron furnaces. This is a free event, all are welcome.